It's no secret that I love to recycle stuff. 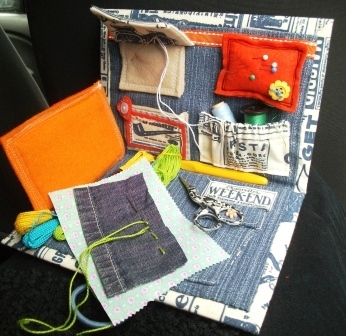 There's a hardback diary that's been stashed in my cupboard since 2009 and now it has a new life - as a travel sewing kit! Yay! 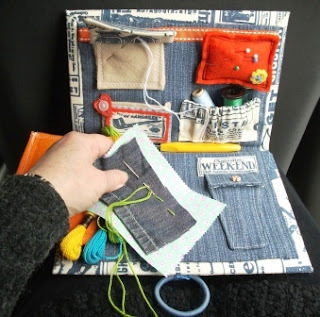 This sewing kit can sit on your knee in the tightest of spots (think bus or train seats) and can even act as a little tiny desk for small sewing tasks! I'm now thinking it needs a companion A5 box for stashing small projects. What a perfect on-the-road kit that pair would make! This dinky little sewing case folds easily and neatly back to an A5 size when your journey's ended (or you've finished your sewing). It's really easy to make, so I've put together a quick tutorial for you. There are lots of steps, but each one only takes a minute or two and they're all easy and pretty much interchangeable - make this kit to suit you and your sewing preferences. 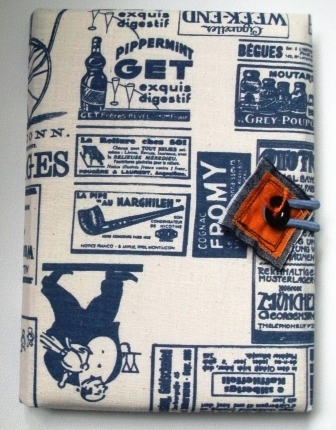 First, take your old diary or (horrors!) hard back book. Be sure to pick one that's very unloved, because the next stage is slashing the pages out! 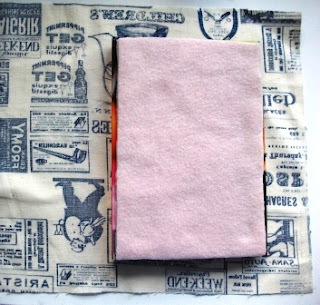 After you've got rid of the pages, you'll need some fabric for the outside, as well as wadding (batting) or fleece. I used two layers of fleece for the padding, which worked well and came from an old blanket. 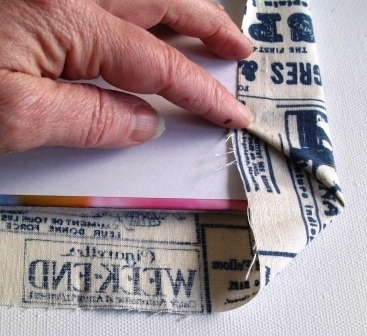 Measure around the edge of the book - flatten the book out, especially along the spine, and cut out a rectangle of fabric, leaving about 1.5" or 2" all the way round the book edges for folding around the edges. 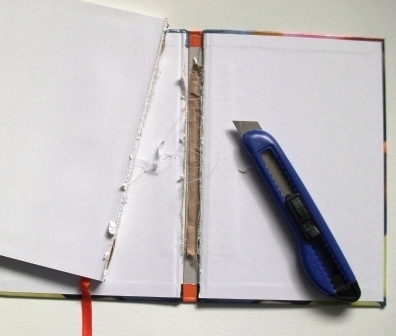 Cut out wadding or fleece by drawing around the book and cutting inside the lines you've drawn. 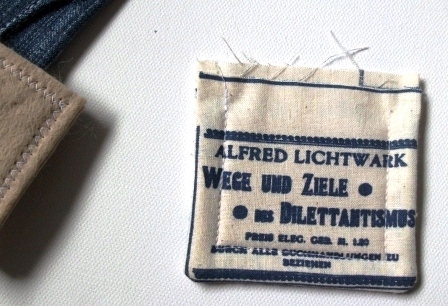 Same again for the lining fabric (old jeans). You want the fleece fabric and denim lining to be just a little smaller than the book. 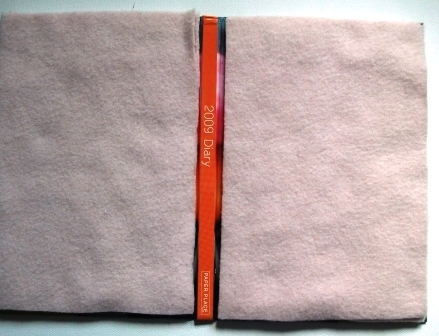 Cut the fleece/wadding fabric in half and trim to fit just inside both covers of the book, leaving the spine uncovered. Place the wadding on the book and use only a few small dabs of glue from the glue gun to position. 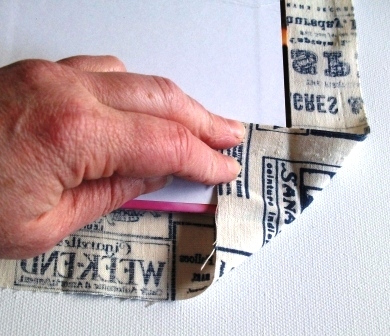 Place the newly-padded book on the outer fabric and fold up the corners as shown, so you get a mitred corner. 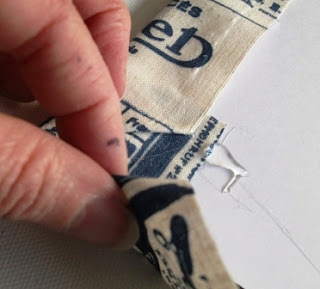 Again, use small dabs of glue to postition - you'll spoil the fabric with too much glue (and you'll make it really hard on yourself later as you'll need to hand sew around here!). 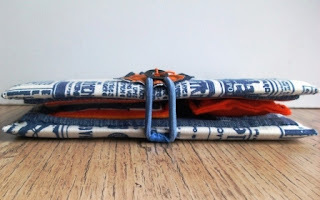 Take care that the fabric isn't stretched too tightly over the spine - the "book" still needs to close. 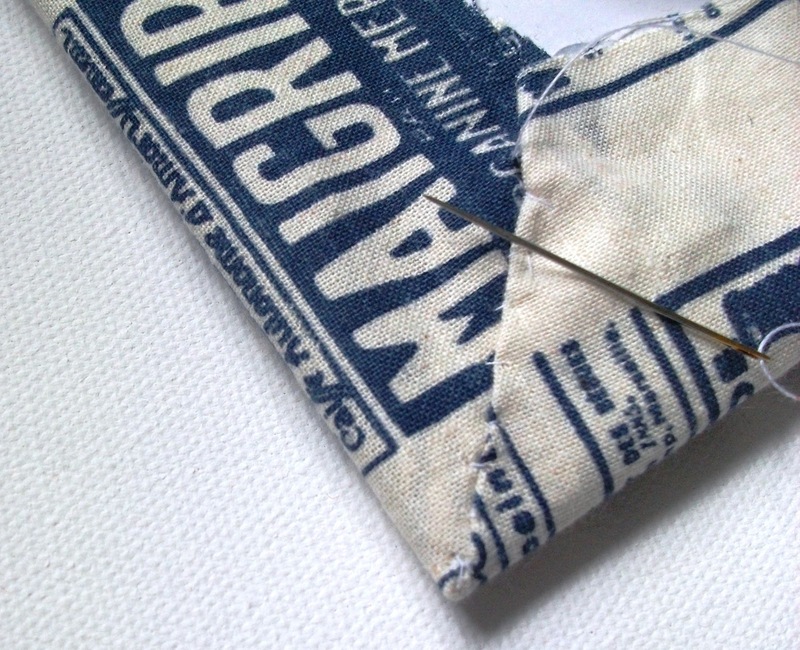 If you want to stitch the mitred corners to neaten, you can do - just use a small slip stich - but it's optional. the photos above and below show the difference between sewing and not sewing those corners - these are before and after shots! Put the cover to one side now while we concentrate on making the inside. 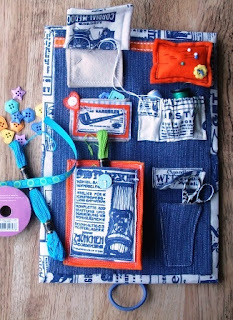 Take the piece of jeans fabric, or whatever you've chosen for your lining, and cut it just inside the line you drew earlier (all around the flattened diary/book). 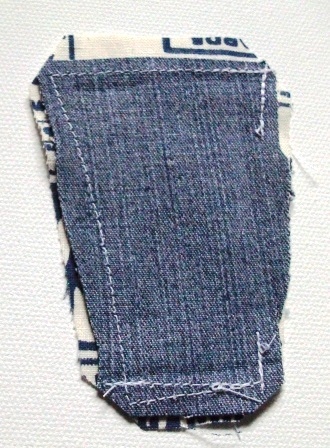 Fold under (about 1/2") and press. Place to one side, but keep it handy so you can decide where all the pockets will be going. Sizes for all these pockets are not crucial, apart from the scissors case and the pocket for the seam ripper - you need your items to fit inside them so you can make them to measure. 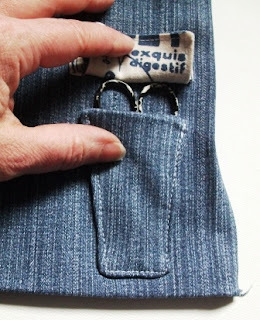 The main thing is to check that all the pockets work together and fit - if they don't, then make them smaller or move them about. The type of sewing you're likely to do on the move might dictate what type of pockets you want. 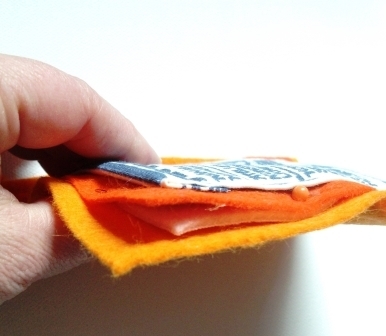 Your needlecase is just a few folds of felt! 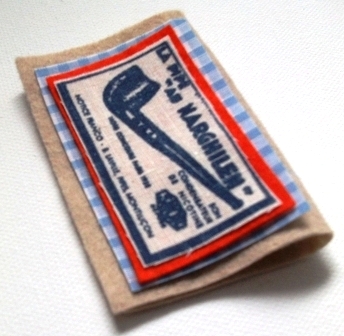 Mine measured 2.5" x 8" and it's folded into four, like this, with the two short ends in the middle. 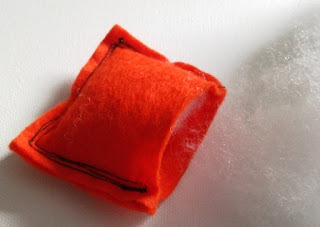 Make a cover for the needlecase from 2 layers of fabric, stitched together with some wadding/fleece between the layers. I topstitched mine. Pin the folds of felt behind the cover, and pin it under a piece of ribbon which reaches all the way across your lining fabric and tuckes under the ends.Machine sew it in place, making sure you catch all layers. 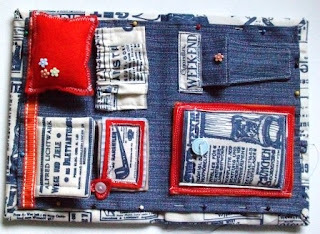 If you want this to be detachable, sew a piece of velcro onto the denim and onto one of the pieces that will make the pincushion. 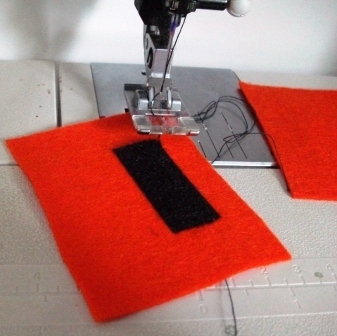 Sew the two pieces of felt together along three sides. Stuff and then sew up the last side. I added a button, too, because it just looked too plain without! 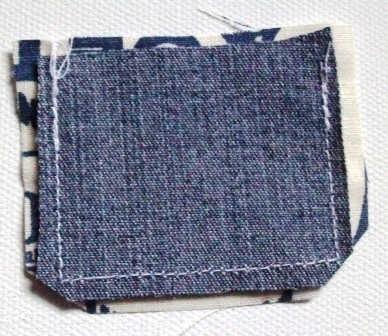 Cut the pocket a couple of inches larger than its finished size, plus seam allowances. 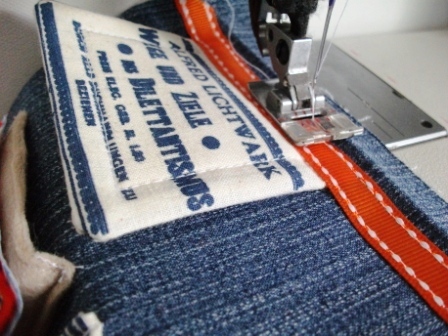 Turn one long edge under and thread elastic through, gathering lightly. Secure at ends with stitching. Turn edges under. Pin into place on the lining, pleating along the bottom edge. 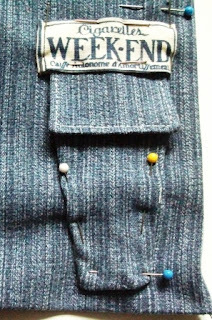 and you can ease the bottom edge to make the pocket stand out slightly at the top. Cut a rectangle about the same length and slightly wider than your scissors (make sure you take into account seam allowances). Cut slim triangles off the corners to make it shaped. Also cut another piece the same width but smaller - keep this one rectangular as it will be the flap which will hold the scissors in place. 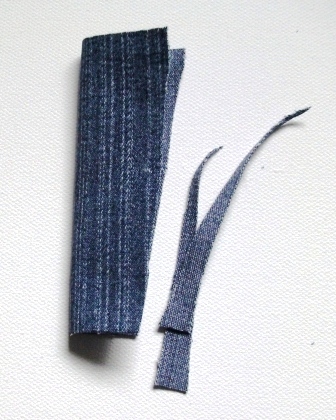 Cut lining fabrics for both pieces (same size). Sew, right sides together, leaving a gap for turning (the gap should be at the top of the flap and the side of the pouch as seen below). 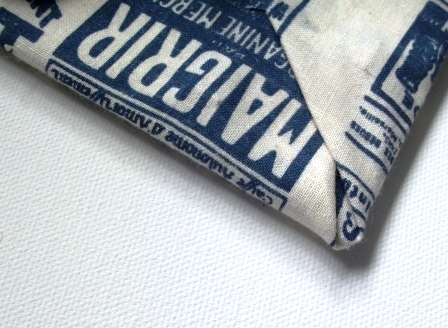 Trim the corners, and trim the thicker fabric close to the seams to eliminate bulk. Turn to right sides, press and sew pouch into place close to the seams. 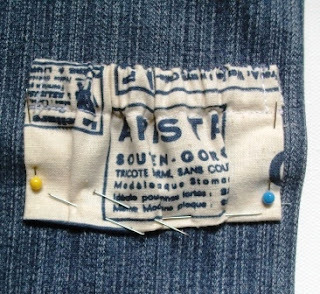 Pin in position and sew down. 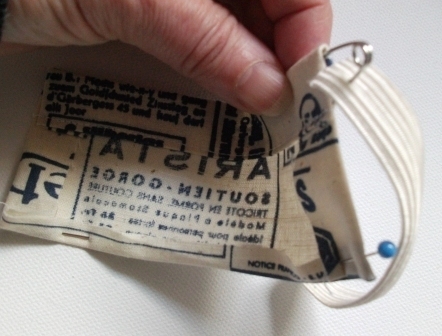 You can see from this photo (below) that I used a piece of fabric to sew across the top of the flap. This means I didn't need to do anything with the opening I used for turning the flap. 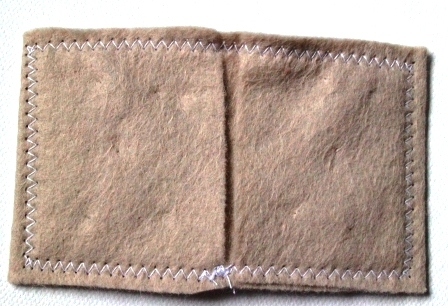 I did topstitch the flap, close to the edge, before pinning into place. If you're careful, you might also be able to sew down the scissors pocket without needing to handsew the opening you used for turning. You'll finish up with a nice neat pocket and the flap will hold the scissors in place very nicely, even without the need for a button. I added a little flower bead to pretty it up! Cut out your rectangle in two fabrics, make a hem and then sew in place, using the hem as the top edge. I covered the seam ripper pocket with a flap made from several layers of fabric. 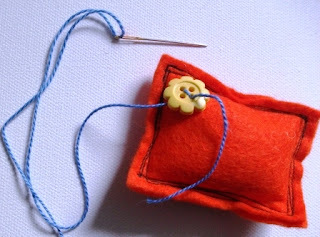 This gives you another place to stow your needle when you're sewing. It also adds a bit of padding to balance the pincushion, so the book kit closes evenly all round. The padding also protects from the sharp edge of the seam ripper if you lose the lid for it on your travels (hmmm... wonder who it was who did that?!). Once all the pockets are attached to the lining, you can stitch the inside to the outside. Place the lining fabric centrally, making sure it fits snugly into the spine and the edges are folded under. 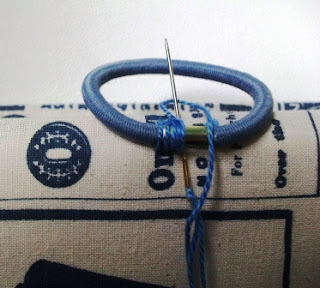 Pin and slip stitch into place (if you were too heavy handed with the glue, this will be difficult!). 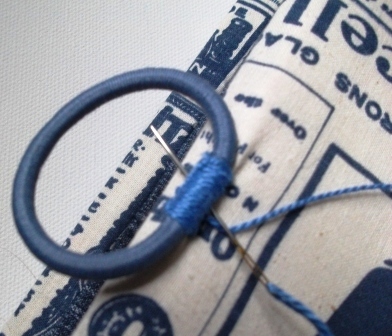 This meant the button stands proud so the elastic can be wrapped round it easily. Sew the button through the fabric onto the front of the book. I sewed it on backwards, with a knot at the front. 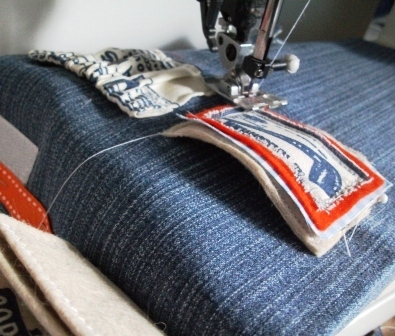 Not only does this add a bit of character, it makes the sewing easier too, as you're sewing onto a rigid surface. The elastic I used was just a simple hair bobble/elastic thingimajig/whatever-they're-called-in-your-part-of-the-world. 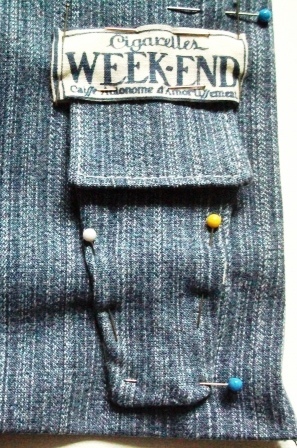 I sewed it into place with embroidery thread and a close blanket stitch, which covered the metal part quite neatly. You'll have to book a long train journey now, just to enjoy some travel sewing! Sure beats gazing out of the window in some of the more built-up parts of the country. P.S. If you first saw me talking about upcycling this diary here, did you guess what it was going to be? If you want to print this tutorial off, it's now available as a free PDF download here - just click the button. This is so genius - I've got to make one!!!! I'd like to link back to this, if I may, for the "Friday Find" I do on my facebook page each week. There's no way I can make it but you never know, one day! I promise you it's easier than it looks! 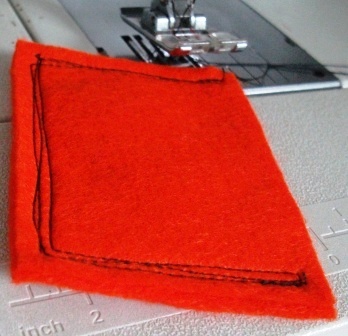 I have just found your blog and this tutorial is ace. Would you mind if I pinned it on my Pinterest account? Hi Lisa, yes, please pin anything you like! I'm more than happy for you to spread the word, as long as it links back here. 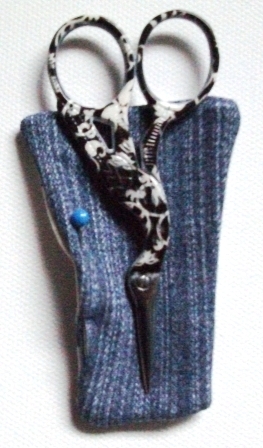 A word re stabbed fingers: if you use denim for the inner it's a lovely, tough finish but handsewing it in is hard on the fingers! This is so amazing and complex! I love how you took care of all the details! Clever idea. Very useful for travelling. As a person who goes away most weekends to my BF's, this is a great idea for me to take. I always forget something when I go. 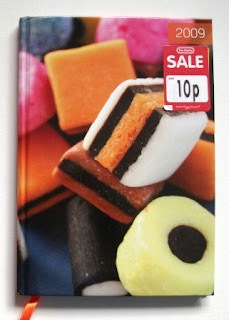 I am also a diary nut, so although I may not cut up a diary, I may buy an old book at the charity shop, and use that.! Great thanks. I found you from a link on Pennibs homepage. Thanks! brava, oggetto molto bello ed originale. complimenti. Cudos for making the cover of Sewing World. That's a neat little kit to have around. Lovely clear tutorial. 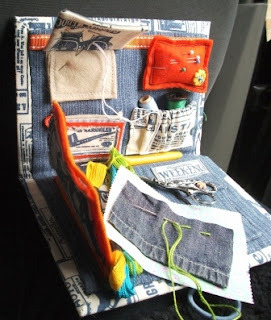 I keep meaning to make myself a neat travel kit, maybe it's time! This was such an amazing read. 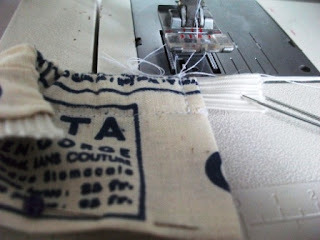 I always find something interesting in your blogs and at artisna.com as well. That is a wonderful place to buy Handmade Goods by Artisan online. Anyway, thanks so much and congrats on your articles! !